Faulty Opener On Your Hands? Your entire overhead door relies on the opener in order to work automatically. It’s by far the most complicated of the system's components, and as a result there are plenty of different problems it can develop. From fried circuit boards to broken motor gears and misaligned safety sensors, our team knows how to quickly identify and repair any problem you may come to experience. In addition to this, we also work with major brands like LiftMaster, Genie and Chamberlain, and can help you choose and install the perfect opener for you. A malfunctioning opener is difficult to deal with, and it’s often hard to know what exactly is wrong with it. Thanks to the many years of experience our technicians have, we can quickly work out what the problem is and apply the right solution for it. Whether it’s a worn motor gear, a problem with the trolley or the drive system itself (a broken chain, for example, or a torn belt), we’ll quickly provide a solution. If we need to replace any components we'll do so on the spot. Opener repair is one of the areas in which we particularly excel, so you can rest assured that we can handle any and all problems, big and small. 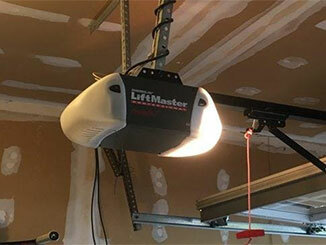 If you’re thinking of investing in a new garage door opener, it can be hard to know where to start. The first choice to make is the type of drive system you need; do you need the smooth, and silent of a belt drive, or the low maintenance and somewhat noisy a screw drive? Perhaps a simple chain drive is perfect for you, combining reliability and durability in an affordable package? That is, if you don't mind the noise and the requirement for more frequent maintenance, of course. Our team will guide you through the process of choosing a new opener, ensuring that you have all the information you need to make the right decision. Once you’ve chosen the right opener for your garage, our technicians will performthe professional installation for you. It’s essential to make sure that your new unit is perfectly connected to your existing door, as otherwise you could be facing more frequent breakdowns in the future, which will translate to more money wasted on preventable repairs.Our team will make sure the trolley is perfectly connected to the door, that the limit switch is adjusted properly and that the safety sensors are able to adequately detect an obstacle. If you need an emergency opener repair service, or are looking to have a new unit installed and want to consult with the experts, our team at Garage Door Repair Burleson is here to help. Contact us for all your opener related needs. Which Brand Should I Choose for My New Opener? Should You Repair Garage Door Springs Yourself? The longer your garage door is forced to function with damaged parts, the worse the issues will become. That’s why we come out to help our customers as quickly as possible and get right to work on repairs. It prevents further harm to the door, as well as more headaches! If you want to schedule an appointment, call us today. Leave your contact information here below and let us know how we can help. We will get back to you shortly! Our company is at your service offering professional services, brand-name products and perfect results on every call! Thank you for choosing our company! Feel free to browse our website for more information in the meantime. Our team at Garage Door Repair Burleson is at your service any time!